Elizabeth Ayers is a regular Marketing client of Ilona Design having initially designed her website for her through Emblime design agency. We help her with organic SEO, website and social media updates, and marketing strategy. 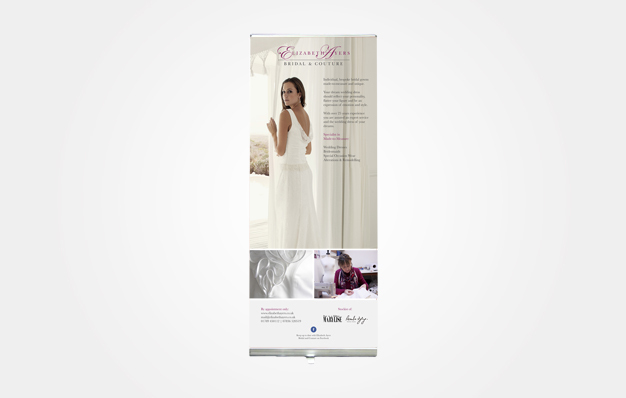 We helped her prepare for one of the many wedding shows she attended this spring by designing this pop up banner for her stand. Elizabeth has nearly 30 years of experience in the designer bridal wear business. Having started training and working in theatre costume, her passion and experience for costume gave her the skills to make brides look their very best on their big day. Over the years she has supplied many shops including Liberty of London and Harrods, being the best-selling designer and short-listed for the Brides magazine “New Designer of the Year” in 1989. We chose a balance of soft, light images that showcase all aspects of Elizabeth Ayers Bridalwear; her skill as a designer maker of dresses, her beautiful range of designer ‘off the peg’ wedding dresses, and her unique made-to-measure dresses.